Lighting-Gallery-net - Incandescent - General Service 25-100 watt/Amplex 75w bulbs. Never knew this brand still existed in 1979. 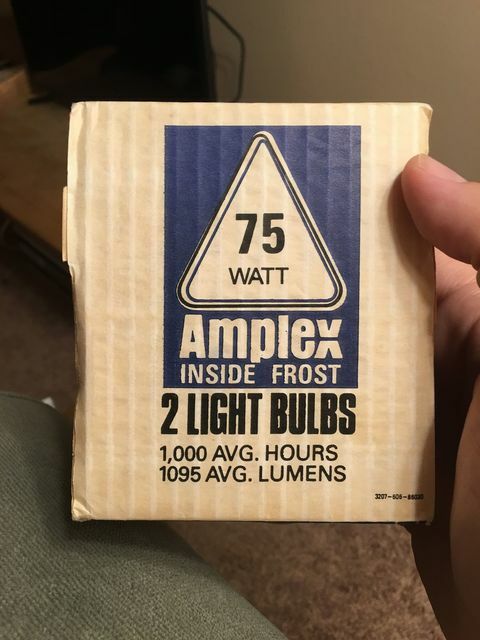 Amplex 75w bulbs. Never knew this brand still existed in 1979. Thought Amplex was absorbed into the Norelco name by 1970. I had some 60W years ago. The package was gray print instead of blue. I bought them around 1978 and they were made in Canada. I tried to do some research on Amplex, couple years ago. Not much info but they seemed to be lighting supplier working with the bigger companies and had their name used on a selection of lamps. Did they actually have their own factory for producing lamps? I rented a house once with two amplex f20t12cw lamps in a fixture in the garage. I was young and didn't think much about them. One was nos since the starter was missing the other was well used. I should have traded them out. @Powergroove- Do you remember if they had the logo with the atom spinning around the letter "A"? If so, 50-60s vintage. @jercar954. Yes they did. The house is still there but I don't know the people living in it. The Amplex catalog from 1958 lists their address as 111 Water Street, Brooklyn,NY. The 1959 catalog gives an address in Carle Place,Long Island,NY. 6.6,7.5,15 and 20 amp, 3000 hour rating. They also had an extensive offering of multiple street light bulbs. I believe that they supplied the City Of New York streetlights. By the late 1950's,NYC had standardized their multiple incandescent luminaires. The open fixtures used 115 or 230 watt bulbs, the smaller refractor luminaires used 340 or 585 watt bulbs,and the largest luminaires used 870 or 1100 watt bulbs. All of these wattages were listed in the Amplex catalog. I remember the Carle Place Long Island address. A local discount store carried their lamps back in the mid 60s. The sleeves were the same colors as the Westinghouse sleeves of the 1940s. I have an Amplex 92w street lighting lamp.